New York – October 28, 2013 – Evertz Technologies (TSX: ET), industry leader in video/data network innovation, will be showcasing the Evertz EXE Video Service Routing Platform at ONUG in New York City October 29-30. Featuring over 46 Tb/s of switching capacity (23Tb/s full duplex, supporting 2304 10GE ports or 192 100GE ports) per single chassis, the Evertz EXE is by far the most powerful modern SDN switching platform. In the emerging world with total network connectivity, annual traffic is projected to exceed 1 zettabyte annually by 2017 and video/data will account for over 65%(1) of the traffic, therefore it is natural for the leaders in video/data to drive innovation. 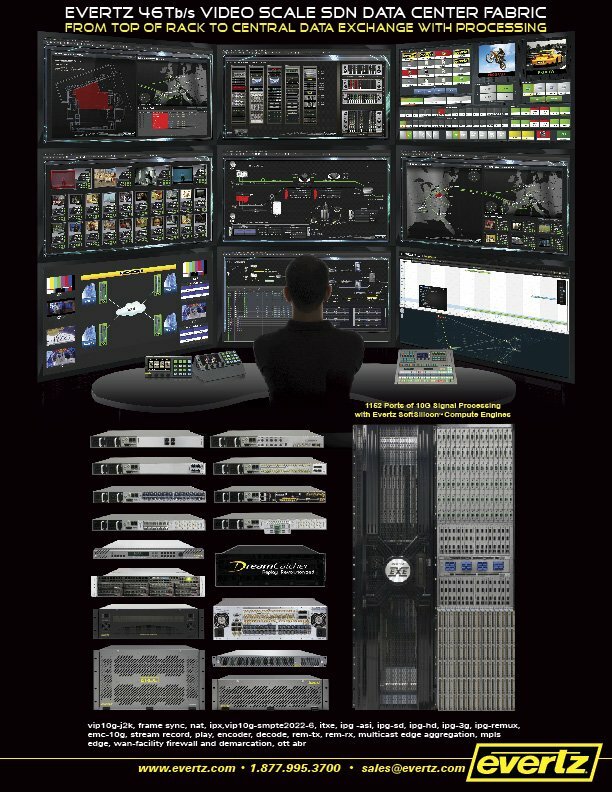 With over 1700 SDN video switch fabrics installed and in operation amongst the worlds’ largest sports, movie and prime time content creators, Evertz has the experience and understands the performance requirements needed to handle service provider video/data traffic today and the vast growth of tomorrow. Evertz SDVN control allows service providers to unleash the true potential of their 10GbE /100GbE IP-Ethernet network and now the EXE VSR Platform, through its intelligent utilization of extreme bandwidth switching, will allow the service operator to harness the video/data tsunami emerging on the horizon. “Due to the nature of video, a CLEAN SLATE approach for the data plane must be taken, much as it has for the control plane with SDN control. Independent development of either is not enough however. Cohesive and temporally unified operation of the SDN control with the data plane is essential. Inline DPI operations specific to video packet signal switching are also essential in addition to bandwidth, SDN orchestration, multi-level scaling, and various tunnel encapsulation techniques,” said Rakesh Patel CTO of Evertz Technologies Limited. At the core of Evertz’ SDVN is their expertise and understanding of the true nature of video in processing, transport and manipulation, and how and where it differs from IT based transport. At the physical layer, Evertz SDVN solution is underpinned by its array of IP Gateway devices (IPG), High Density Media Gateway (MG) and IPX/EXE Tb/s 10GbE ported switch fabrics and network attached video/data transformation platforms. As global IP traffic continues to grow, increasingly driven by video/data, the metro edge and core bandwidth requirements will be pushed to their limit and not only in the traditional sense. With video/data being the most challenging form of data to transport, with the pressures of low latency, and no time to retransmit data, the technical challenges placed on core network infrastructure are an order magnitude more difficult than those of today. “The opportunity to innovate is tremendous, and Evertz is committed to add immense value. We were there at the onset of the transition to High Definition Television and have helped shaped the transition and the industry. We expect to do the same in this space,” said Romolo Magarelli President and CEO of Evertz Technologies Limited. With the biggest names in video/data using Evertz SDN solutions and with over 860 Tb/s of video bandwidth currently under management across over 500 installations worldwide, Evertz is The Solution wherever video and data is Priority 1.